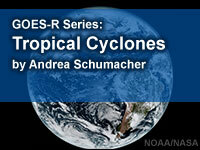 In this webinar recording, Andrea Schumacher demonstrates the GOES-R series' new capabilities for real-time tropical cyclone analysis and monitoring, which will contribute significantly to improved hurricane track and intensity forecasts. The GOES-16 imager will provide dramatic new views of tropical cyclone phenomena, offering vastly improved time and spatial resolution as well as color composite images to enhance cloud bands and other features. This webinar will also explore the role of the Geostationary Lightning Mapper (GLM) in helping identify areas of strong thunderstorms associated with tropical cyclone intensification. Great presentation on the new GOES satellite. Learned a lot! Excellent presentation. Clear presentation of content. Good intro to GOES 16. Would love to see more real examples worked in, especially to compare/contrast improvements. Pretty good info. Helpful with integration of new GOES 16. Lots of new insight and features. This was an amazing lesson! The tutor was very helpful! Thanks so much!